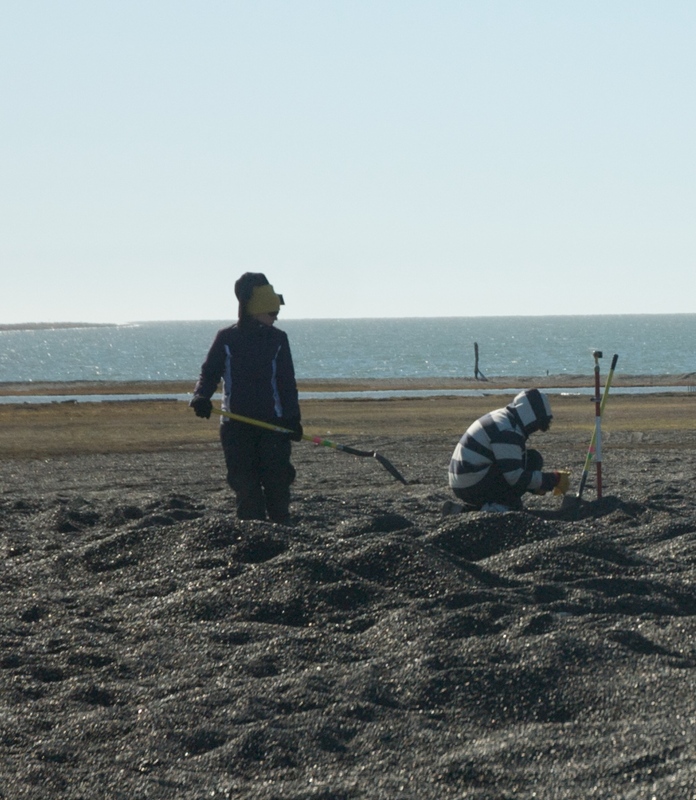 Since 2004, we have had a primary site datum NUVUK 1, with two others that were used as control points. 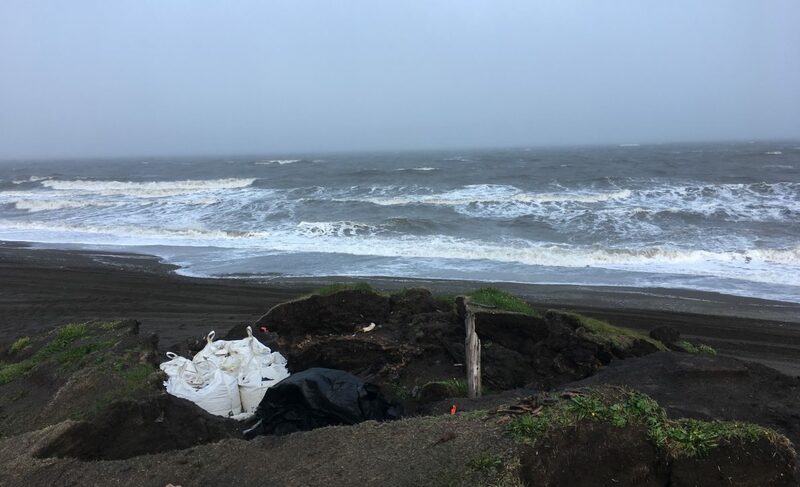 As the bluff continued to erode, it became clear that we would need to abandon the primary datum, so last year local surveyor Chris Stein set three more datums. This year, the primary datum was no longer a good place to set up, so I switched to setting the total station up at NUVUK 2 (our former primary reference point, and using NUVUK 1 as the reference. The program we use, called EDM, is a really nice special purpose piece of software, written just for recording archaeological excavations with a total station. It is really configurable and can make major use of menus, which means no typos and a cleaner field catalog down the road. It allows you to set up (once you get the instrument over the datum point and level) by putting a reflector on the reference point (another datum for which you have coordinates, telling the program where the instrument is. It then does the geometry and lets you confirm where the program thinks the instrument is and which way it is facing. With that information and the angle and distance to any other point, the program does the geometry to figure out where the artifact you are recording is in the site grid. For all this to work, the datums have to be precisely recorded. On July 20th, we actually had to move NUVUK 1. When Chris set it, he’d chosen a high point, with vegetation, as a good stable vantage point. The only problem was that we weren’t sure that it didn’t have a grave under, and the erosion was getting closer. We had to pull it and see, rather than risk loosing a person to the ocean. All the other datums were quite far away (a good thing for control points) so we needed something more convenient to where we were excavating for ease in checking the setup, or restarting after battery issues. I picked a spot below one of the guy wires for the beacon pole, since the wire made it less likely that anyone would disturb it with a vehicle. We made extra sure of our setup, checked it with NUVUK 4, and tried to yank NUVUK 1. It didn’t want to come out. We tried tapping gently with a mallet. We really didn’t want to be too aggressive, because we weren’t sure if it was in a burial. In the end, we had to excavate shovel test pits all around to loosen it enough to remove. Fortunately, there was no burial. We put the stake into the chosen new location, and shot it in. For the rest of the season, we checked setups with NUVUK 4 as well as NUVUK 1(A), and it seems to be stable. While all this was going on, part of the crew was finishing excavation of another burial 10D75. This burial appeared to be quite disturbed at first, but actually was fairly well-preserved except for the top. The rest of the crew was STPing. Rochelle found one burial in an STP, and Trace found another by exposing some aged wood (we call it “burial wood” because the wood in burials just has a certain look to it) while walking. We recorded and back-filled STPs around the two locations so that we could shift windbreaks there the next day. Posted on August 4, 2010 by Anne JensenPosted in Archaeology, fieldTagged Archaeology, burial, crew, field, technology.